The best thing you can do after a tiring week is to party with your best friends and dance like no one is around. That is what Salman Khan and Bobby Deol did. 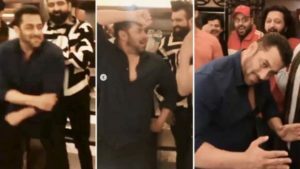 Salman Khan the 53-year-old actor is known for his unique style and partying skills, and that’s why we are sharing this viral video of Salman Khan and Bobby Deol dancing to Gur Nal Ishq Mitha, the video was posted on Instagram. The video has been curated by fan clubs on different social media platforms that features Saqib Saleem, Badshah, Bobby Deol, and Riteish Deshmukh. With the busy schedule of Salman Khan, he still managed to take out some time and joined Sohail Khan, his brother, at a Celebrity Cricket League match that was held in Chandigarh. Bobby Deol and Salman Khan were both in the movie of Samir Karnik in 2008 which was named Heroes, and Race 3, a movie by Remo D’Souza which was released in 2018. Salman Khan also made a special appearance in Yamla Pagla Deewana: Phir Se the last release of Bobby Deol, the movie also starred Dharmendra the father of Bobby and Sunny Deol. The shooting of Bharat has kept Salman Khan really bust lately, the movie is directed by Ali Abbas and will have Katrina Kaif, Disha Patani, Nora Fatehi, Tabu, and Sunil Grover as the co-stars of the movie. Bharat will be released on this year’s Eid.